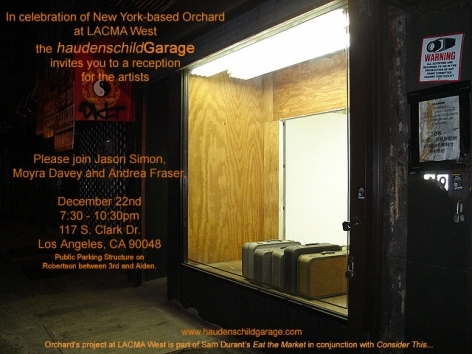 On December 22, 2006 the haudenschildGarage held a FUEL4TALK for the Orchard Group at the Garage's space in Los Angeles. Some attendees included Jason Simon, Moyra Davey,Andrea Fraser, Teddy Cruz, Evelyne Jouanno and Hou Hanru. Orchard was a three-year project of a cooperatively organized exhibition and event space in New York's Lower East Side. It was completed on May 25, 2008. The gallery was run by twelve partners of a for-profit limited liability corporation founded for the project. The partners include artists, filmmakers, critics, art historians, and curators, with several combining these activities in their practices. Some of the partners included Rhea Anastas, Moyra Davey, Andrea Fraser, Nicolás Guagnini, Gareth James, Christian Philipp Müller, Jeff Preiss, R.H. Quaytman, Karin Schneider, Jason Simon, and John Yancy, Jr.